A four legged Silex with a weaponized arm. Silex Summary, AD 2210 Dec 2. 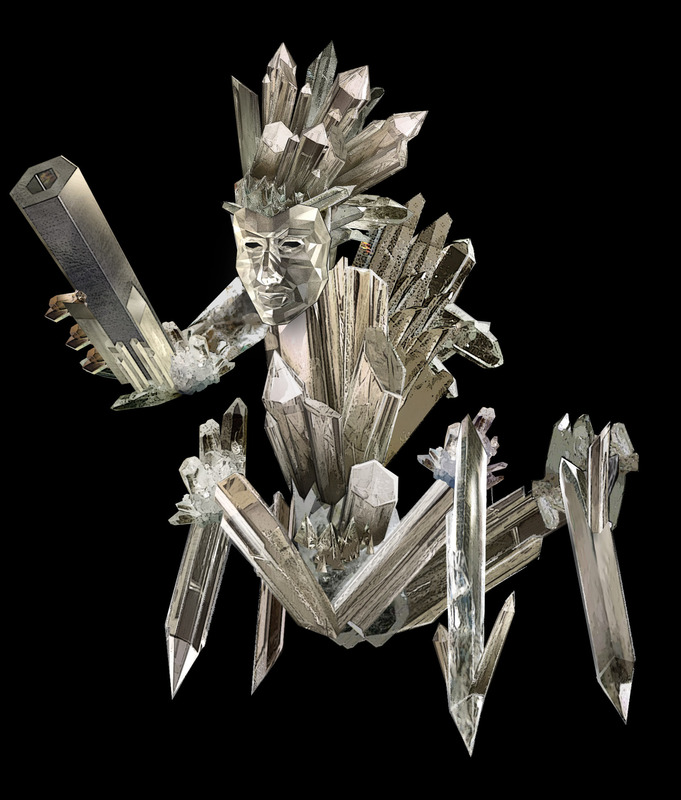 The Silex are a crystalline silicate life form. The Silex have only two internal organ of flesh, their brain and a muscle similar to a heart that pumps fluid and/or gasses. Silex are slow moving, long thinking , and very unique in that their bodies do not grow according to a genetic plan. The Silex themselves control growth, depending on what the individual being needs to perform functions. Growth occurs very slowly, as they must ingest and absorb the materials they need to grow a desired appendage. Silex do have a male and female concept, though one could not tell them apart by looking. When Silex reproduce, the male and female each detach and expunge a small piece of their brain. When the two make contact, they merge. They then, together, craft a transparent crystalline casing for the new brain about the size of a bowling ball and place it into a nutrient rich bath. The “baby” Silex absorbs its food and begins to grow the heart muscle. Once complete, the solution is modified to include the materials needed for the infant to begin growing more layers of hard crystal around its core, then appendages that will make it ambulatory, followed by appendages that will allow it to manipulate objects. Once a new Silex has done this, (and had knowledge transfer from its parents – see below) it is considered to be an adult member of society. Silex communicate with vibration. They can send and receive frequencies caused by the internal vibration of their crystalline structure that are not detectable with human senses. Their knowledge and memories can be transferred from one Silex to another this way, leaving a perfect impression of “data storage”. So, although they think slowly, no bit of knowledge gained is ever lost as it is transferred from one generation to the next. Silex govern by Commune, vibrating their thoughts up a “pyramid” until the designated Emperor knows all and makes decisions. Over the course of their species development, they learned to control and augment their harmonics to be incredibly strong and highly focused. Silex who have grown themselves to be warriors could shatter a human skull with a focused sonic blast just as easily as it could if it struck the skull with a grown hundred pound “club” appendage. No two Silex are built alike… their hard, planar, crystalline surface can vary from milky white, to amber, to obsidian. Some grow two legs, some four, some eight, and some grow a huge “ball” at their base that they use to roll themselves around with. They vary themselves in size according to their role in society. A Sliex could be the size of a dog, or the size of an elephant, depending on its purpose. If an appendage is broken, it can repair itself in time. If it is too badly damage, it will detatch the appendage and grow a new one to replace it. In terms of age, it is said that Silex are immortal. To kill a Silex, the brain must be poisoned or destroyed. “Integration” into galactic society, and the influence of other cultures, particularly human, created new traditions and new roles for Silex. Building a unique “face” became a popular fad that swept the Silex empire in the first age, prior to the rise of the Core, and still survives today. It provided both individuality and a greater level of comfort when interfacing with other races. A mature Silex face will often resemble a sculpture of a human face. It is known that Silex are particularly fond of music.